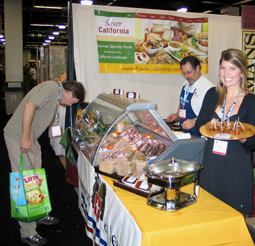 The biggest and best food show in the country came back home to San Francisco in 2009, and Savor California had a spectacular 10-booth island. 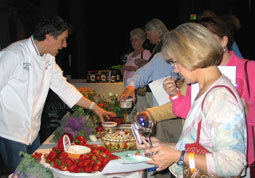 Twenty-eight companies showcased their products in the Savor California booth. In short, it was amazing! The San Francisco Wine Competition is the largest and most prestigious competition for American wines in the world. Along with 35 gourmet food and beverage producers from Savor California, hundreds of medal-winning wines were served at this event which sells out in advance. 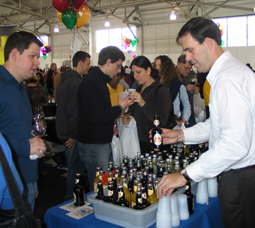 Greg Warwick pours Fentimans "botanically brewed beverages" at the 2009 Chronicle Tasting. Savor California returned to the world's largest natural and organic products trade show with Fentimans Botanically Brewed Beverages and Marcel et Henri Charcuterie Française. Howard Nep and Hannah Cooper served Marcel et Henri patés and sausages. The world’s oldest and largest gastronomic society, founded in 1248 by King Louis IX, hosted an incomparable food and wine pairing event, with all the gourmet artisan foods provided by Savor California. 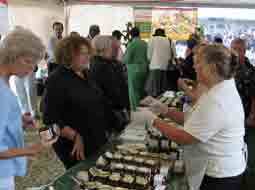 Dina and Jill talked with La Chaine members about McEvoy Ranch Olive Oil and other farm-made products. The best in the West was on display at this show on the beautiful grounds of the Sunset Magazine Headquarters. Savor California had its biggest booth ever, where 16 companies offered their gourmet food products for sampling and for sale. Everyone had a good time at the Savor California booth, including Greg Warwick, who was pouring Fentimans Sodas, and Laura Curran who was offering samples of Sonoma Syrup. For the third year, Savor California wowed the trade with products from Bella Chi-Cha, Lula's Chocolates, Porta Mangiare, San Angel Mole, Scoma's, Sonoma Crisps, and Spindel Farms. 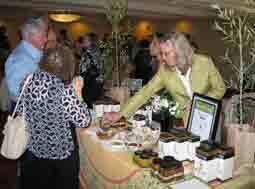 Bella Chi won a Silver sofi Award for their Creamy Goat Cheese Torta with Apricots. 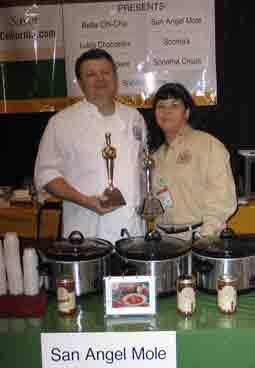 San Angel Mole won a Gold sofi for their Cascabel Sauce. Vignette Wine Country Soda was poured in the Savor California Fancy Food Show booth in 2008. This was just an amazing party! Members of the San Francisco Professional Food Society enjoyed a spectacular barbecue menu made entirely with specialty food products from gourmet producers on SavorCalifornia.com. A walk-around appetizer tasting showcase products from 14 producers included pate, salsas, mini-kabobs with rubs, cheeses, and more. 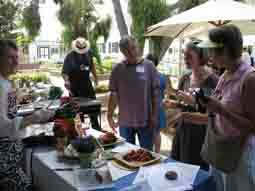 The barbecue featured Brandt Beef, Marcel et Henri sausages, salads, pinquito beans and all the accompaniments. Desserts? Well, you had to have been there to believe it! 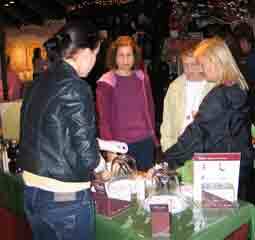 Caren Hicks introduces members to a new product, Seitan, a tasty alternative for offering a vegetarian menu item. This is the longest running jazz festival in the world. More than 500 top jazz artists perform throughout the weekend on 9 stages spread throughout the grounds. 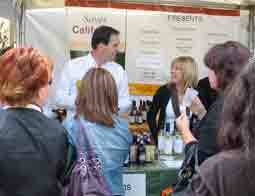 At the Savor California booth gourmet foods and beverages were available to sample and purchase. No jazz fan would miss this festival! Especially not when they could taste and purchase products from: A Perfect Pear from Napa Valley (foreground), Deb Deb's Rub Rub, La Bella Olives, Silver Moon, Sonoma Crisps, and Wild Planet! Just in time for the holidays, Savor California companies offered their gourmet products for tastes and purchase at the Pomona Harvest Festival: 21 Missions Organic Agave, A Perfect Pear from Napa Valley, Amellas Caramels, Napa Valley Fudge, and Spindel Farms.